There are a number of misconceptions and mistakes people make about oral care, and we hear a lot of them in our office. Many people underestimate the importance of good oral health when it comes to their overall health, for example. Other people have mistaken ideas about brushing and flossing, as well as gum disease and oral health in general. Let’s take a look at some of the misconceptions people have about their oral health. We briefly touched on this above, but this is probably one of the most common mistakes people make when considering their oral health. The truth is that trouble in your mouth can be one of the first indicators of other health issues you might be having. In fact, gum disease is linked to a number of serious health problems, including heart disease, stroke, and the risk for some cancers. Taking care of your mouth should be a big part of your overall good health regimen. This is another misconception many people have about oral health. Have a beautiful smile goes way beyond just esthetics. Smiling has been shown to improve your mood—and that of those around you. If you smile when you are not feeling happy, you will most likely start to feel happier. Smiling is good for the soul! And those who have a white, bright smile are much more apt to show it off. 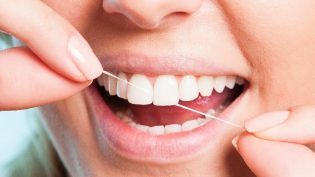 We hear it all the time: “I’ve been meaning to floss more.” Flossing will take just a minute or two each day, and for that minimal investment of time, you will get big rewards. Not only does flossing dislodge any food that might be stuck between your teeth, but this has other positive results. It will help you avoid the buildup of plaque, which can cause bad breath and lead to other health issues. Just a few minutes a day can positively impact your entire well-being! Don’t fall prey to common misconceptions/mistakes about oral care. Taking care of your mouth means taking care of your entire body. Call your Rancho Bernardo cosmetic dentist Classic Dental Smiles to find out more about making sure you have a healthy and beautiful smile you love to show the world!